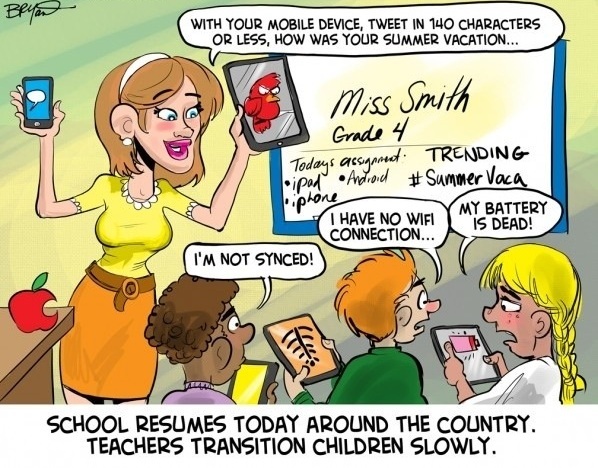 The comic above really speaks to my first few days at work this school year and to some of the tones towards writing and technology that I have experienced in ETEC 540 so far. New technological advances come with loses and gains. Teachers, even with the best intentions and preparation, are not immune to the ‘finikiness’ of technology. I just started a position at a school as their ICT Integrator. I met many teachers who came back to work after summer filled with optimism and great tech integration ideas, but wireless/log in troubleshoot, low battery, etc. proved to completely drain the effectiveness of their lessons. The Tweeting comment in the comic also speaks to the ever changing influence technology and popularity can have on our concept of writing. Iambic pentameter vs. 140 characters 🙂 I am currently in my 9/10 MET course and have had a great experience, I’m sure this course will be no different. I look forward to working with all of you!!! This entry was posted in Introductions, Technology, Text, Uncategorized. Bookmark the permalink.